If you’ve been reading here for any length of time you may remember when I got into kombucha. I let my SCOBY go into the compost when I was pregnant and for much of the year after Forest was born but, I think it was last summer, my SIL gave me her SCOBY because she wasn’t doing much with kombucha at the time. Well, it molded quickly and I had to chunk it. I ended up ordering another SCOBY from Kombucha Kamp and had success with it for 6-8 months. 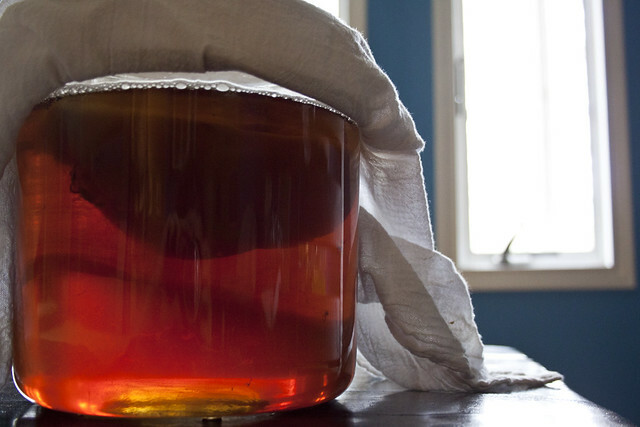 There were some down times when I wouldn’t be interested in brewing and would let the SCOBY just hang out for a month or six weeks before I’d revive it. Well, back in early January I’d renewed my interest and had just brewed some tasty pineapple flavored kombucha and wanted to make more. Well, MOLD! Again. So, I threw the SCOBY into the compost pile and asked my mom to bring me a bit of her SCOBY when she came to visit us the next time. Mom and Dad were here over the last weekend and so my kombucha is now revived! I even bought some fancy schmancy bottles that were on clearance at Target to make it all that more enticing to take with me. There’s just something about having a special drink in a special bottle that makes it easier to sip and take with you. Now, to wait two weeks on that first ferment! It’s been about three years since I’ve made sauerkraut. The first time was four years ago and it was really fun to see the process take place. Previously I had let the cabbage ferment for about four weeks but this time I only left it for two. It has just the right sour but plenty of crunch which was something that was missing from the last two ferments I did. I let them go just a little too long, I think. We have radishes that are beyond ready to be picked in the vegetable garden. I’ve been pondering what to do with them as we’re not very good at eating them fresh. Frankly, we both think we need to do better about eating what we grow. I think we did so much better when we were eating vegetarian meals primarily. Now, not so much. Plus, there’s that toddler that now occupies our house; he makes things a smidge more difficult during meal planning for the week. Back in December I did a traditional pickled radish mix with some of the radishes in the garden. I’ve been eating them with my boiled eggs on occasion, and it pairs great with them; a nice salty/vinegar combination. In an effort to try something different I began reading up on small batch fermenting. There’s actually several different options for using Mason/Ball jars as fermenting vessels but I opted to use the Mason Tops Pickle Pipe and Pickle Pebble to try my experiments. 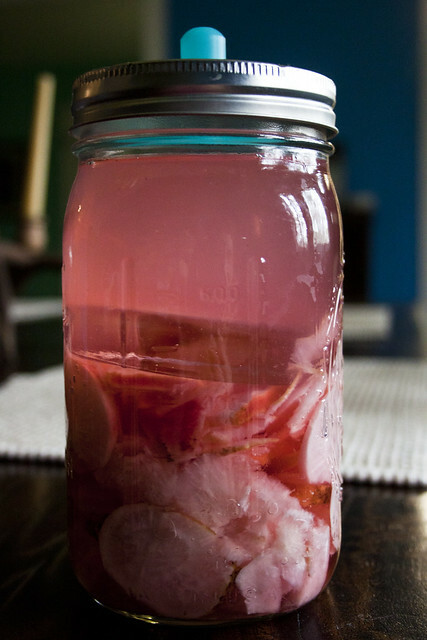 I started a ferment using this recipe last Wednesday and tried my radishes on Saturday. They had just a bit of tang but I wanted a little bit more so I left them for a few more days. I will give them another whirl soon! I’m very excited about the ease of this small batch style of fermenting. Since I was excited about the radishes I got into a let-me-ferment-everything mode. We had a pepper plant that lasted through most of our mild winter, up until an actually decent sub-freezing night or two at the end of January. Chris and I went out there and pulled the ripe peppers off of the plant so he could plant potatoes in that spot a few weeks ago. The peppers have been sitting in my fridge since then with the plan that I was going to dry them. The problem is we already have a bunch of ground, dried pepper that I made the summer before Forest was born and we’ve barely used it. Why did I need more of that? So, I looked up fermented pepper recipes and came up with A Great Idea! Homemade Tabasco!! Yep! I followed this recipe and cannot wait to see how it turns out in a few months! 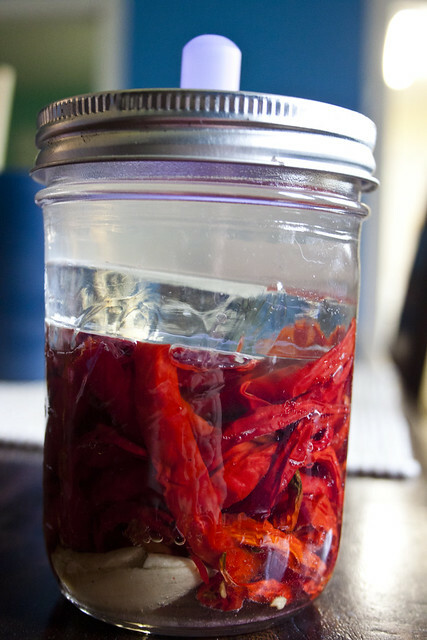 We definitely use hot sauce around here and it would be really cool to have something like this, a good alternative to using peppers. We love to grow peppers but definitely have trouble using them. I asked Chris for a mead kit at Christmas and I got one. The problem was I felt completely inept as even thinking about starting a batch of mead without doing a lot of reading and YouTube watching first. I still have not started my batch of mead yet because I’m terrified about ruining our honey. I ended up ordering a book about making mead since I felt the directions that came with the kit were lacking, and have started watching some YouTube videos. In the end, it doesn’t seem terribly hard but the biggest thing is to sanitize, sanitize, sanitize before hand. I’m hoping in a few weeks I will get a batch of mead started and will report back to you on that then! I keep thinking I should get into fermenting but something is holding me back. Maybe I should start with sauerkraut, that should be easy enough, right?